Cathedral surrounded: St Carthage’s Cathedral caught up in the flooding in Lismore. Photo: Supplied. LISMORE priest Fr Peter Karam has not seen anything like the 2017 flood that inundated his South Lismore church and school. Fr Karam was emotional as he ventured inside Our Lady Help of Christians Church. All the furnishings, with the exception of the pews, have been damaged or destroyed, putting a major curtail on the parish’s Easter celebrations. “It’s the most savage and devastating flood in living memory,” Fr Karam said. Our Lady Help of Christians parish school was not safe either with “enormous” damage affecting furnishings and damaging “beyond repair” the school’s IT equipment. Families brought their young children to save what was left of the battered region. “A huge contingent of helpers washed, scraped, pressure-cleaned, carried and dumped debris,” Fr Karam said. “Then it was off to the church for the same hours and tasks to clean and wash before the mud set, ensuring that we could worship together at Easter and honour the memory of those parishioners, religious and clergy who have maintained the church since its opening in 1941. 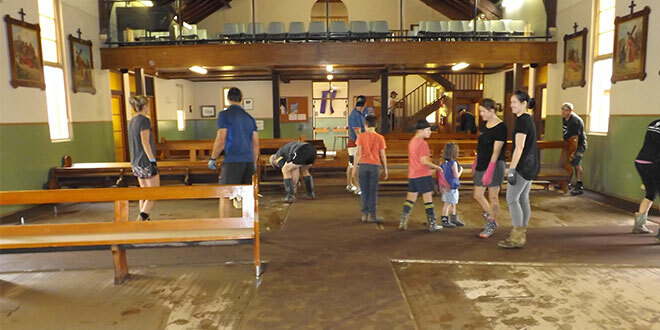 Flooding aftermath: Families from the Our Lady Help of Christians parish assist with the clean-up at their beloved church. Everything was destroyed or damaged except for the pews. Photo: Fr Peter Karam. Murwillumbah parish priest Fr Anthony Lemon grew up in Lismore and is “no stranger to floods and the suffering they bring”. He would watch families lose everything from his parents’ house on the top of a hill. This time Fr Lemon was seeing the devastation take place in his own parish community. “Many of our parishioners have lost everything,” he said. “Homes and businesses that have never been flooded, flooded this time. “The look of horror and shock on people’s faces as we washed out the basements to get an access into the school was deeply saddening. South Murwillumbah was also hit hard, with people losing cars, bikes and furniture, and businesses losing entire premises. One man died in a caravan park and several others were hospitalised. In Burringbar, south-east of Murwillumbah, some elderly have lost all their possessions and their homes “with no means of starting over”. “Little ones were shoved up into roof cavities as the water roared around them threating to wash their houses away,” Fr Lemon said. But out of the darkness there is light. 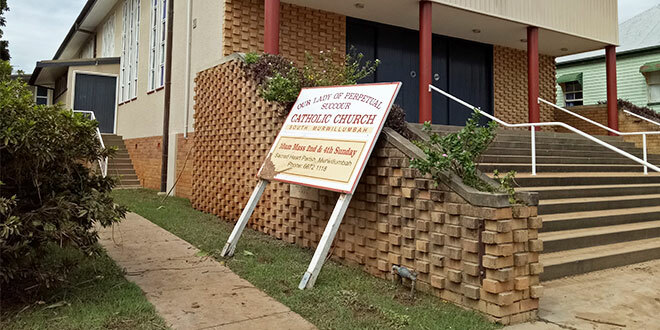 Damaged property: The sign for Our Lady of Perpetual Succour Church at South Murwillumbah fell over as the flood rushed through Lismore. Photo: Supplied. For Fr Karam, the mental stress was “beyond calculation” but the South Lismore parish priest said the town had emerged stronger than before. “A positive aspect of all of this has been people rallying to assist, encourage and reconnect,” he said. “I believe we will have a stronger community here in Lismore in the wake of this tragedy. cleanup: Members of the Trinity Catholic College community help with the clean-up after floodwaters have receded from around the school. “There is an old maxim: ‘When the going gets tough, the tough get going’. Four schools in the city of Lismore are closed until further notice, including Trinity Catholic College; St John’s College, Woodlawn; and St Carthage’s Primary. 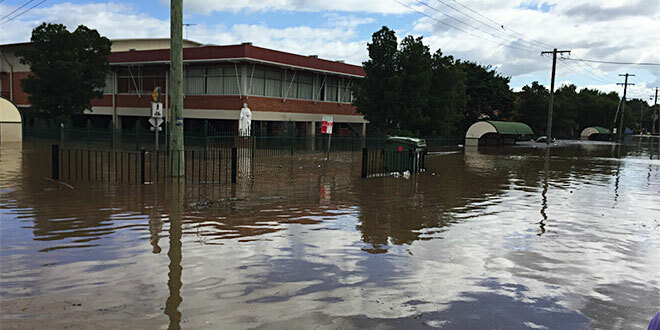 Trinity Catholic College sits near the Wilsons River, which spilled over into the school precinct destroying items inside classrooms and offices. Many students live on farming properties and are still isolated by the flood. In Murwillumbah – Mount St Patrick College, Mount St Patrick Primary and St Joseph’s Primary – were forced to close. The schoolyard at St Joseph’s Primary, Coraki, was submerged but classrooms were out of action, and St Joseph’s Primary, Woodburn, also closed. Lismore’s Catholic Schools Office director David Condon advised parents only send children to school if there were no threats to their safety. “All schools will open as soon as humanly possible but damage has been such that a number of schools may not re-open until the beginning of Term 2,” Mr Condon said. The diocese’s new Bishop Gregory Homeming was on the ground assisting people affected by the floods. 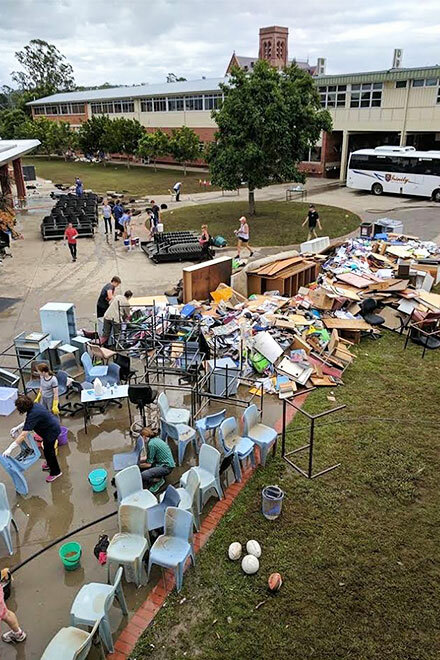 The St Vincent de Paul Society in New South Wales launched an emergency flood appeal for the Northern Rivers in the wake of the big clean-up. The society is asking people to give financial donations that will be used by the charity’s volunteers to support people devastated by the flood. NSW state council president Denis Walsh said in a Vinnies eNewsletter that the charity could only help if the public gave generously. 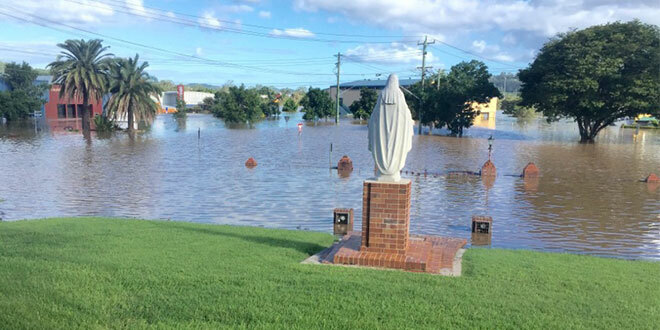 School surrounded: Flood waters engulf the St Joseph’s site at Trinity Catholic College, one of the worst hit schools in Lismore.